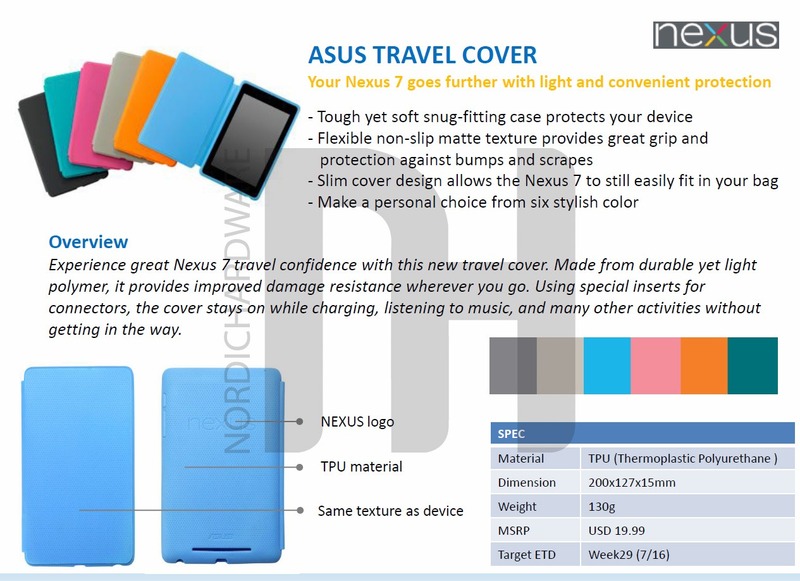 Since the Nexus 7 was originally announced, we knew that there were more accessories on the way. For starters, the device has four pogo pins that don't match any currently available accessories. Well, now we're getting a first look at the next batch of extras. For starters, there's a landscape multimedia dock that will be available for $49.99, and will be able to charge the device as well as transmit audio output via a 3.5mm plug. 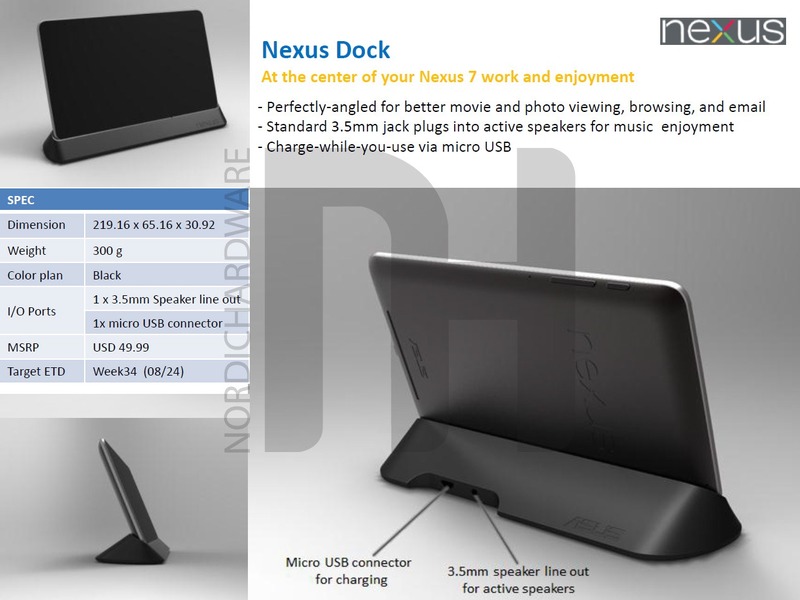 The slides say the dock should be available "Week34 (08/24)", which could mean on August 24th, or at least within that week. If covers were more your thing, we're also looking at a variety of cases that aren't currently available. 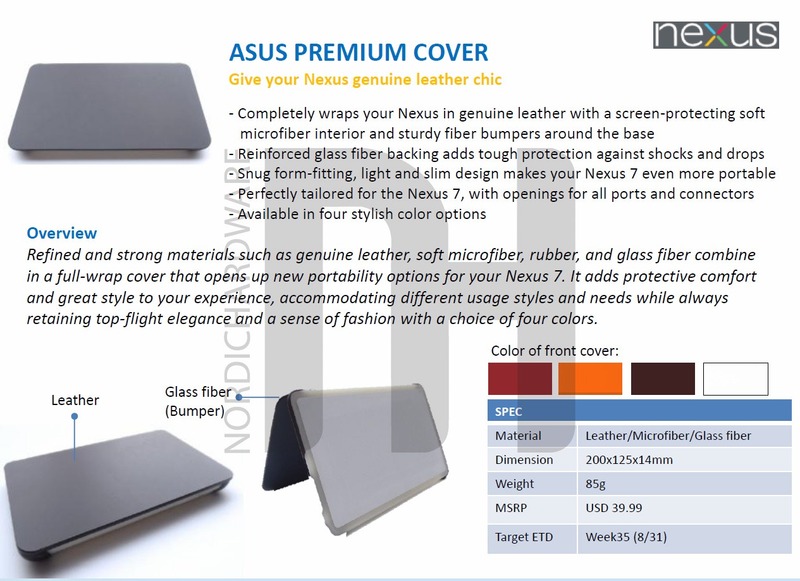 For starters, a premium leather case with glass fiber bumpers is set to arrive in "Week35 (08/31)" for $39. 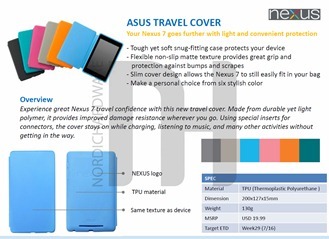 Additionally, different colored versions of the $19 case currently available on the Play Store will be on their way. The slides indicate that the multicolored cases should actually arrive during Week29 (07/16). If that date looks familiar, it may be because you've already seen it once this month. In the past. This may indicate that not only are these slides old, but it seems that at the very least, the estimated arrival of the multicolored cases may be delayed. This could also indicate that the other accessories may arrive later than expected, but it's impossible to be sure. What is sure is that these accessories look rather slick. The premium accessories even offer an attractive option for consumers. The Play Store already sells some reasonably-priced covers and chargers. 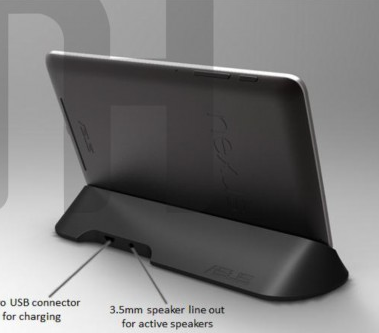 If you're looking to invest a bit more into your tablet for a slicker experience, though, Google and ASUS will be more than happy to shut up and take your money.